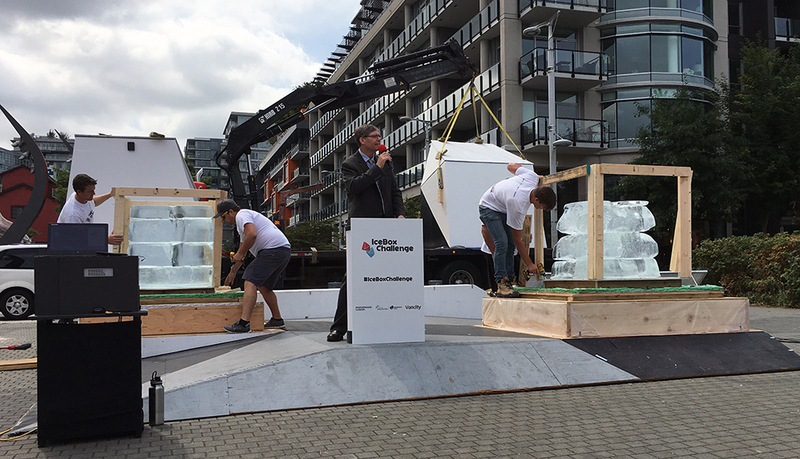 On July 27, we launched Ice Box Challenge by loading one tonne of ice into each of two small structures on the Vancouver waterfront. One structure was built to the BC Building Code. The other was insulated to the Passive House Standard. We then left both boxes to sit in the sun on the Vancouver waterfront for 18 days. On August 14, we opened the boxes before an audience of about 100 Passive House supporters, media and curious onlookers. 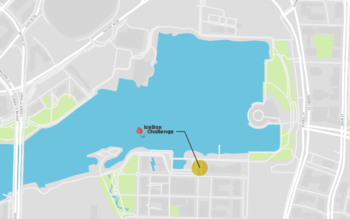 Josh Usher of MistyWest, the Vancouver-based company that monitored the ice box performance throughout the event, announced the weights of the remaining ice to the 100 expectant and curious people: 639 kilograms of ice remained in the Passive House box. Only 407 kg of ice remained n the B.C. Building Code box. As part of Ice Box Challenge, we had invited members of the public to submit their guesses of how much ice would remain in the boxes. Alex Yakovenko won the Ice Box Challenge competition’s first prize, a Whistler getaway with a tour of Whistler-area Passive House buildings. Bernadette Zuniga won a one-year Science World membership. In the end, however, the biggest winners of the Ice Box Challenge are the Passive House community. The event was held to raise awareness of the benefits and affordability of high-performance buildings among Vancouver-area residents. Significant coverage of the event by online and traditional media got the word out, while social media extended the event’s reach within and beyond B.C. Since the event started, Seattle has contacted us for information to help them host their own Ice Box Challenge later this year, and New Zealand is also planning a similar event. Ice Box Challenge was run by Passive House Canada, with support from the City of Vancouver, Vancity and members of the local design and construction industry. We thank everyone who volunteered time, donated materials, supplies and expertise, and who cheered the project along. 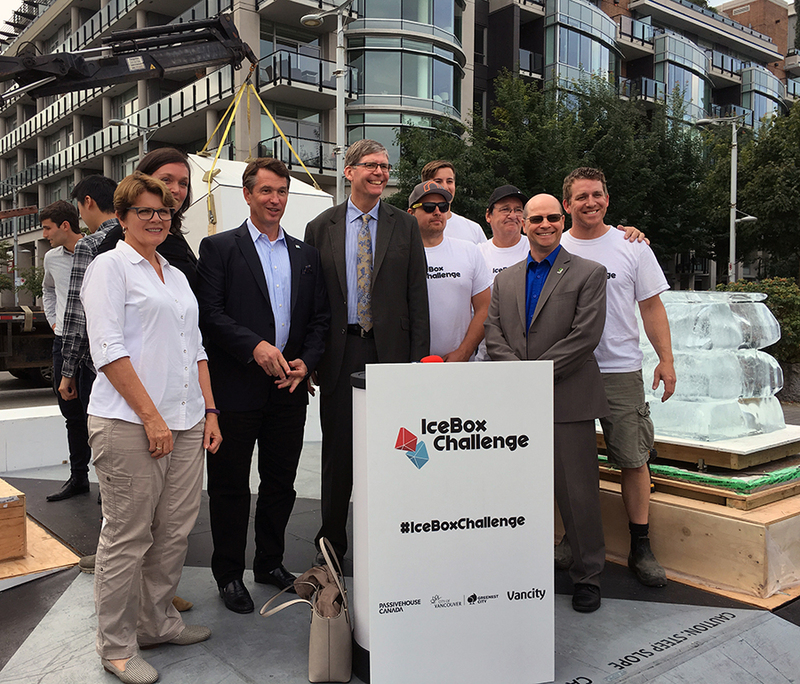 Our speakers, special guests and wrap-up construction crew, during Ice Box Challenge final event, August 14, 2017: CHBA-BC President Lynn Harrison, Passive House-certified architect Sandra Rohler, CHBA-BC CEO Neil Moody, Passive House CEO Rob Bernhardt, Chris Hill of Ritchie Construction, City of Vancouver Acting Director of Sustainability Doug Smith, Shaun St-Amour of Footprint Sustainable Housing Corp.